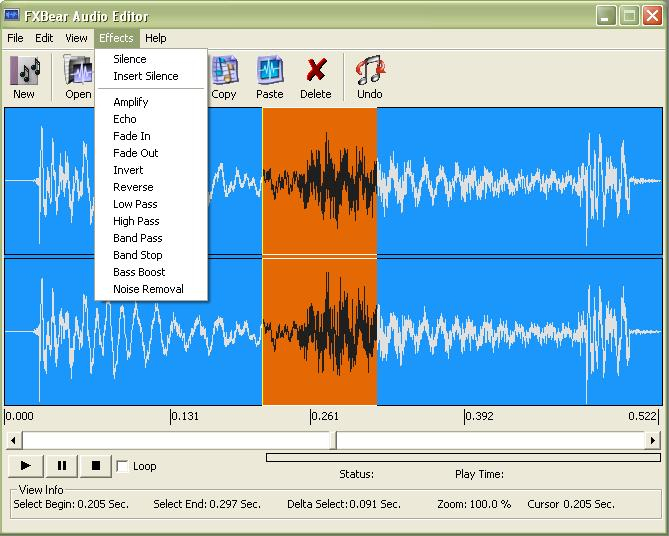 FXBear Audio Editor 1 - Download Win Apps. Powerful audio editor software, edit MP3's, WMA, OGG and WAV..
FAE is an easy to use tool for editing MP3, WMA, OGG, and WAV audio files. The software can copy and paste selections of audio content, delete selections, save selections to a new file, save the entire audio file to a new file and/or format, and edit tag data. Editing operations supported include silence, amplify, echo, fade in, fade out, invert, reverse, low pass, high pass, band pass, band stop, bass boost, and noise removal. Makes the program an excellent assistant of your audio editing work as well as a great partner of creating audio enjoyment. Our software development group keeps good design and ease of use and in mind all through.